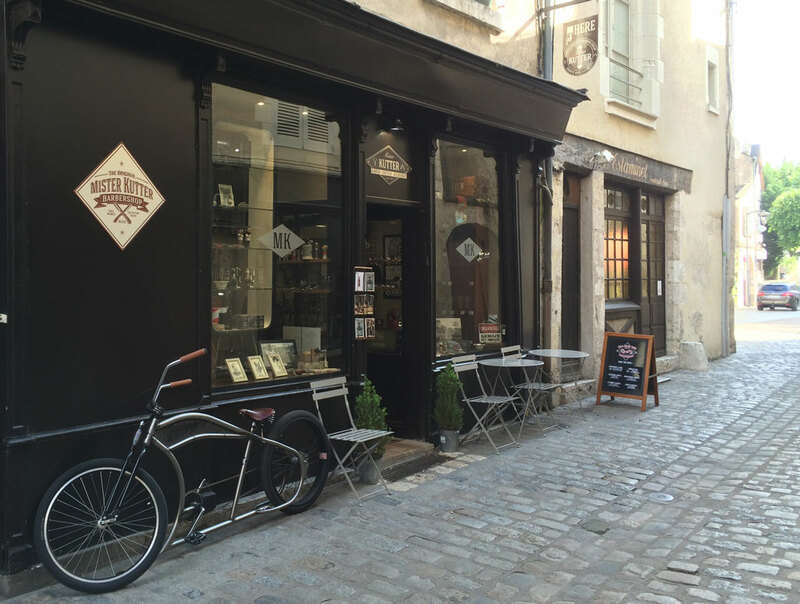 I didn’t think that barber shops still existed but I saw a man being shaved inside this one in the historical part of Blois. Je ne pensais pas que les barbiers existaient encore mais j’ai vu un monsieur qui se faisait raser dans ce magasin dans le vieux Blois. It looks quite old fashioned. For some reason a nearby neighbourhood to my home has three of them, all still doing good business, even so close together. Sort of “back to basics” maybe? I imagine dedicated hipsters are keen customers of barber shops. I once gave Simon a gift voucher for one of the famous barbers in London. He kind of enjoyed it, but wasn’t used to that kind of personal treatment so felt a little uncomfortable at the same time. The bicycle interests me. Is it for real? I’ don’t know enough about bikes to know. I can understand Simon’s reaction. I don’t even like going to the hairdressers. Interesting that In Blois the Management would call the shop Mister Kutter with a ‘K’ . That bike looks very modern. Brand names are very complicated. Maybe the “K” meant he could chose the word “Kutter”. I’ll have a closer look at the bike next time. Great Pic!! Would love to have checked it out myself! Maybe got behind the chair and start cutting some hair. Thanks for the post!